Fat Quarter Shop's Jolly Jabber: It's Sew Emma Spotlight: Website Premiere! 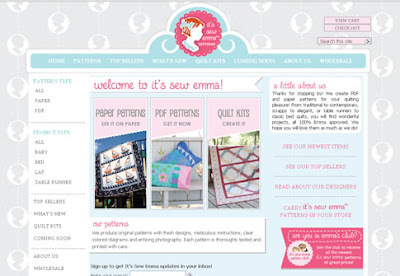 It's Sew Emma Spotlight: Website Premiere! Happy Friday! It is a happy day for us because we have officially launched our new It’s Sew Emma website. We love it and hope you do too! On our new website, you can find all of our patterns in paper and PDF format and read about our team of designers. We also have wholesale and distribution information available for shop owners. Please hop on over and let us know what you think! While you’re there, sign up for updates, so you’ll be the first to know about everything It’s Sew Emma! We are also super…duper…supercalifragilistically excited about Fall Market at the end of the month! Yes, I spelled out that nonsensical word because it sums up our sentiments pretty well. You’ll see why in a few weeks. Stay tuned!